Even though beards may be becoming more acceptable in the workplace and fashionable in general, in the professional world, they are still often looked down upon. They are treated as a sign of a man who does not care about his personal appearance or the first impression he has on others. For other professions, the reason an absence of facial hair is preferred is more practical. The military, for instance, does not want long facial hair getting caught in the guns that soldiers use. For the food industry, facial hair will often have to be netted in order to prevent cross-contamination. Regardless of the reason, many men need to shave. However, not all men wish to use open bladed razors. There are numerous reasons why this may be the case and they all influence which best electric razor for men you should choose instead. That is why we have researched the electric razors on the market and collected our top three choices as well as a budget option. After using this review guide, you should feel comfortable finding the electric razor that best suits your needs. For our Gold Pick Winner, we went with Braun which has been a reliable and innovative shaving company for some time. Braun, a German company, is actually a subsidiary of The Gillette Company which in and of itself if a subsidiary of the Proctor and Gamble pharmaceutical company. Thus, all of these connection points to a focus on the health and effectiveness of the consumer. The Braun Series 9 9090cc Electric Shaver with Cleaning Center continues Braun’s trend of innovation, and the hefty price tag is actually earned rather than bestowed based on brand recognition. The Braun is a foil shaver which allows you to get a much closer shave than with a rotary shaver. However, the Braun was designed not simply to give a close shave, but to provide an excellent shaving experience even under punishing conditions. Specifically, the Braun was designed to be able to handle a full 3 days’ worth of average facial hair growth for every shave. This electric razor utilizes 4 specialized cutting elements that generate 40,000 cross-cutting actions per second. Moreover, each of the 4 cutting elements is designed to accommodate a different type of hair. This makes the Braun Series 9 9090cc Electric Shaver with Cleaning Center an incredibly versatile razor that is effective for all types of hair whether it is thick or fine, curly or straight. This maximum utility also prevents skin irritation from the hair being pulled out or cut too deep. This is exceptional and allows you to shave quicker. To point, the numerous blades and cutting actions cut more hair with every pass. This prevents you from having to over the same spot multiple times to cut missed hairs. Of course, you will need to use the appropriate electric razor shaving technique to see the full benefits of this—specifically, you will need to shave in slow, smooth, even strokes. If you push too hard, you may simply mush the hairs, trapping them between your face and the razor. Moreover, if you move too quickly, you run the risk of missing the hairs altogether or, worse, trapping the hairs in the foil guide and simply pulling them out. Furthermore, to ensure that you get the closest shave possible, the Braun Series 9 9090cc Electric Shaver with Cleaning Center utilizes SyncroSonic technology. This feature essentially uses the vibratory patterns of the electric razor’s motor to raise the hairs from your skin. The erect hairs are then easier to grab by one of the two foil guards and are cut. The Braun however, is not simply willing to rely on your technique and the subtle manipulation of hair follicles with vibration to ensure that you get a close shave. This razor also comes with a HyperLift and Cut Trimmer that essentially guides the loose hairs that do not respond to the other techniques and technologies into the blades for removal. With this multi-pronged, high-tech approach, the Braun provides one of, if not, the closest shaves that an electric razor is capable of providing. The Braun Series still finds ways to improve on old designs. For instance, the foil head itself is incredibly mobile all things considered. The Braun’s foil head is able to move along the vertical and frontal axes. This means the head will push in if pressure is applied as well as lean forward or backward depending on the direction of the stroke. 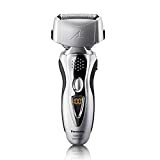 If those were the only directional functions, it would still put the Braun in one of the highest classes of foil head mobility, but this electric razor goes one step beyond that. Not only do all of the heads have a four-way directionality, but there is even a quasi-horizontal directionality added in that the left and right sides of the foil head are able to respond independently of one another. This means the left side of the foil head may be pressed down along a contour of the face, while the right side of the head remains positioned further out vertically. What this essentially translates into is the Braun being exceptionally adaptable for the various contours of the face and able to mold effortlessly from angle to angle in way that rivals many of the traditionally more mobile rotary razors. All of these factors combine to make the Braun an incredibly effective razor, but this beast simply will not quit. In a veritable coup de grace, the Braun is also 100 percent waterproof. Let us be clear, this does not mean that the Braun is simply water resistant and can be used in the shower. It most definitely can be used in the shower, but it goes well beyond those capabilities. When we say the Braun is 100 percent waterproof, we mean just that. You can literally drop the Braun into a pool of water, take it out, and it would not have stopped running at any point along the way. Keep in mind, it is still not a great idea to try and stress test this feature to see exactly how far the limits of its waterproofing can go, but for an electric razor to essentially be not just shower but bath-friendly, this is an impressive feat. However, this razor does work best in dry conditions, so you may want to keep that in mind. The model up is intended for wet and dry use as part of the design. Moreover, this makes cleanup a breeze. Whereas on of the primary advantages that rotary heads generally have on foil heads is an easier cleanup, the Braun completely nullifies that advantage. At this point, the Braun may well have designed the ideal electric razor. However, chances are that they are already hard at work thinking of ways to make an incredible accomplishment of technological design even better. Beyond the shave effectiveness itself, the Braun Series 9 9090cc Electric Shaver with Cleaning Center has also advanced the cleaning process. As if being able to clean the electric razor in water was not enough of a benefit, the Braun also comes with a docking station that cleans and charges the razor simultaneously. This means that the Braun has a station which is convenient as a holding position. While it is occupying the general space that you would normally put it when not in use anyway, it is also being charged and cleaned. This means that you should never have to worry about the battery running out of its charge. In fact, you should not have to worry about the battery at all as it is incredibly unlikely that you will ever drain the battery beyond 50 percent unless you simply decide to use it for multiple people—which is somewhat unusual—or for non-facial grooming, for instance, if you keep a shaved head. The Braun Series 9 9090cc Electric Shaver with Cleaning Center also comes with a 2-year warranty to guard against failure. The heads also last an incredible two years before needing to be changed, though the cleaning cartridges need to be changed every 3 to 4 months. Regardless, Braun has really outdone themselves and set the bar exceedingly high for its competition. As you will see, they have yet to meet that standard. In a lot of ways, our Silver Pick Runner-Up, the Philips Norelco 1250X/42, can be seen as the rotary head version of the Braun 9090. This is not an exact comparison, but it is a fairly close approximation. Philips actually nabs two spots on this list, but the heist is the 1250X/42. Philips is another company that has a long history providing quality and innovative shaving products. 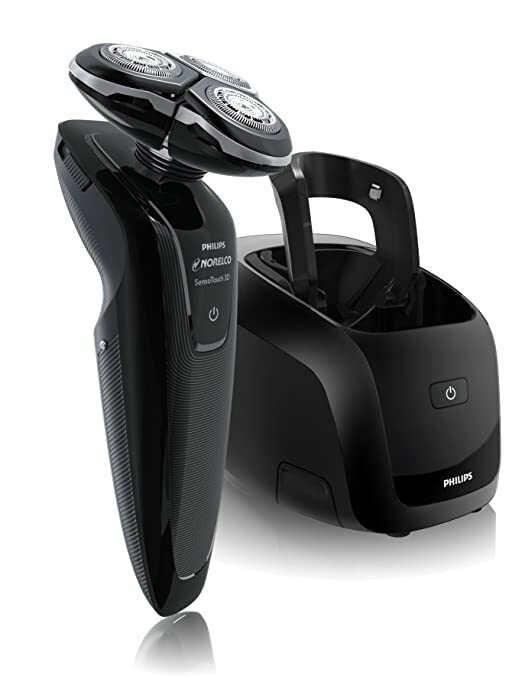 The Philips Norelco 1250X/42 SensoTouch 3D Electric Razor is a three head rotary system. This means that you will likely not receive quite as close of a shave as the Braun or other foil head electric razors. Still, the 1250X does have some impressive features that makes it more than worthy of the second pick and potentially puts it above the Braun for some users depending on their needs. Unfortunately for the 1250X, it is not appreciably different in price than the Braun. However, one area where this electric razor can shine above its competitor is in regards to sensitivity. For those of you with especially sensitive skin, the Philips Norelco 1250X/42 SensoTouch 3D Electric Razor may be a better choice for you than the Braun. Keep in mind, the Braun is still more than capable of providing a superior cut for many people with sensitive skin. This caveat only applies for those with extremely sensitive skin. Part of the reason for this is because the 1250X’s rotary head system allows far more mobility than the Braun. The Braun may have an incredibly mobile head for a foil head, but even the most agile foil head will still fall short of the sheer maneuverability of the best rotary head electric razor. The Philips Norelco 1250X/42 SensoTouch 3D Electric Razor’s rotary head is also one of the best in its class. The three heads are able to pivot in a circular motion, though they do not truly move along the vertical axis. Regardless, this 360 degree tilting action allows the 1250X to accommodate more varieties of contour than even the Braun. This maneuverability is also not a fixed state where all three heads move in unison. In fact, this agility is so pronounced that each head is technically capable of moving independently of the others and in opposing directions. However, it is very unlikely—if not impossible, that a human face will provide contours that calls for such extreme directional movement, but it is still possible. Moreover, as an additional benefit for those who have extra sensitive skin, the 1250X can be used with both shaving cream and gels. In this way, the Philips Norelco 1250X/42 SensoTouch 3D Electric Razor is probably the better choice if even electric razors cause problems for your skin. This does not even account for the fact that rotary heads are inherently gentler and have a much lower chance of pulling hair or cutting the hair below the skin. In anticipation of this, the 1250X has been designed with a non-slip grip, so you can shave in the shower and not have to worry about dropping your expensive razor and potentially damaging it. Similar to the Braun, the 1250X also sports a precision trimmer for those areas that you do not want to shave completely, but instead prefer to give a nice edge. Still, the razor acknowledges that its cutting action is not quite the best, and whether you are shaving or trimming, you are advised to take your time and use slow, smooth strokes. Moreover, when shaving, it is expected that you will have to make more than a single pass to cut all of the hair of a given area. Regardless, the 1250X is still an exceptional razor, especially when compared to its competition that are not in the highest class of Braun. Keeping in line with its true, legitimate competition, the 1250X also comes with its own docking station called the Jet Clean system. Much like the Braun, this station melds the obvious holding position of the electric razor when not in use with the background functions of cleaning and charging it. The 1250X is able to cut continuously for 50 hours on a full charge which translates to about half a month. If you do happen to run out of battery life for some reason, the Philips Norelco 1250X/42 SensoTouch 3D Electric Razor will charge back up to full power in 1 hour, aside from cleaning and charging the 1250X, the Jet Clean system also lubricates the guides and blades sot that cutting remains a smooth process. This further makes it exceptional for those with sensitive skin. Cleaning the Philips Norelco 1250X/42 SensoTouch 3D Electric Razor is a snap—literally. There is a lock and the heads open from the middle out on a hinge. The AquaSeal design allows you to clean it with water without the risk of damaging it. This electric razor does come with a 2-year warranty to guard against failure. Unfortunately, the battery of the 1250X is not replaceable, so when the battery finally depletes completely, you will actually have to buy a brand new razor. The Bronze Pick Third Place winner goes to the Panasonic Arc3. Panasonic is known for making a wide variety of electronics, though they do not specialize in the shaving industry nor do they produce the best electric razor. Of course, this understandable, and they still produce a quality razor at an incredibly reasonable price. The Panasonic ES8103S Arc3 Men’s Electric Shaver is a foil head razor so you will get a pretty close shave. However, unlike the Braun, the Panasonic has not been optimized to produce one of the best electric shaving experiences possible. First, the Panasonic only has 3 blades. These blades are incredibly sharp and use Nanotech machining, but with an electric razor, it is generally not a matter of how sharp the blades are. With an electric razor, it is more about getting the hair through the guide and the guide itself being thin. The Panasonic does the second well enough with the guide using a similar Nanotech machining process. However, the extra features designed to ensure that the hair is raised and placed in the guides are generally absent. 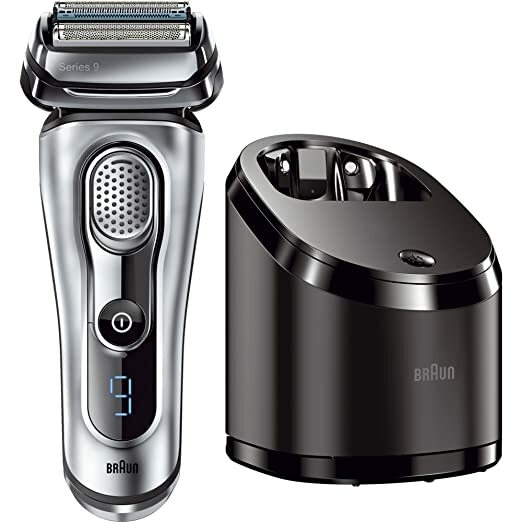 Moreover, Panasonic ES8103S Arc3 Men’s Electric Shaver’s motor is not really anywhere near the power of the Braun’s. Whereas the Braun has 40,000 cutting actions per minute, the Panasonic only manages 13,000. This means that you are likely going to have to go over the same area multiple times, regardless of how slow and smooth your shaving stroke is. This is only exacerbated by the lack of hair-raising features. One area where this foil razor actually bests the Braun is in the wet and dry department. While the Braun is more than capable of being used in the shower, it is still designed for a dry shave and advised to be used in dry condition. The Panasonic ES8103S Arc3 Men’s Electric Shaver makes use of more specific waterproofing technology so that you can use this razor in the shower or dry just as effectively. Of course, whether wet or dry, the motor and the foil head somewhat limit this effectiveness anyway. Still, for those who have sensitive skin but want the closeness of a foil head electric shaver, this might be the better option. Just keep in mind that you will have to go over the same areas more than once which may lead to the irritation you were trying to avoid. To compound matters for those with sensitive skin, the foil head of the Panasonic ES8103S Arc3 Men’s Electric Shaver is not nearly as mobile as that of the Braun. This, however, should be somewhat expected. The Braun made it a point to deliver one of the most maneuverable shaving experiences with a foil head possible. Still, it really feels like the Panasonic ES8103S Arc3 Men’s Electric Shaver could have made a few design changes to have allowed a far greater range of motion. As a result, the Panasonic will have a more difficult time giving you the close shave you desire from the foil head in some of the more difficult contours. To point, the heads themselves only adjust vertically. They do not really move forward or backward depending on the direction of the stroke, and they certainly do not move independently on the left or right side of the head. Of course, if you are looking for a solid foil head electric razor at a very manageable price point, the Panasonic is not poor. The wet and dry function allows you to clean this electric razor fairly easily, especially considering how some of the other foil head electric razors at this price point respond to water. It should be remembered, that the Braun will also clean easily underwater without affecting its performance. It is only in the shower that this razor may potentially be better suited—though, even then, that is unlikely. Still, the Panasonic ES8103S Arc3 Men’s Electric Shaver is compatible with creams and gels, and that is something the Braun cannot do. The Panasonic ES8103S Arc3 Men’s Electric Shaver comes with a nice display that tells you how much of a charge you still have left, gives you a cleaning reminder, and indicates whether or not you are using the sonic cleaning mode. It should be noted that the sonic cleaning mode does not translate to the shaving experience. Unlike the Braun, the sonic mode of the Panasonic is for cleaning only and will not aid in raising hairs. Our budget pick is also our second Philips Norelco model. Like the previous Philips, this one too is a rotary head electric razor. However, unlike the 1250X, there will be no mistaking this for the best rotary experience. Still, for a fraction of the cost—about 10 percent that of the 1250X or the Braun—and around half the cost of the Panasonic, this is a suitable budget option that will get the job done. 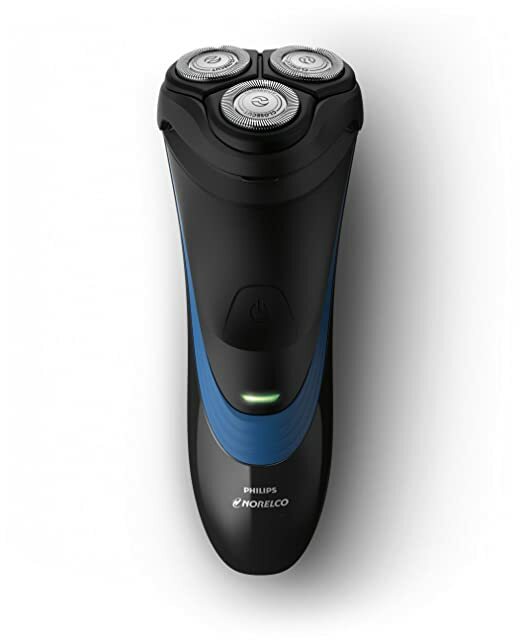 Following the Philips Norelco Electric Shaver 2100 rotary head design paradigm, the Norelco 2100 also has 3 heads. However, unlike the 1250X, the heads of the 2100 are not nearly as mobile. In fairness, they are still far more mobile than the average foil head electric shaver, but they may not even be as mobile as the Braun. Though, that might be expected, as the Braun is designed to be the most agile foil head electric shaver on the market. Still, the 2100’s rotary heads do have four directional movements, though this is not actually the 360-degree directional movement of the 1250X, and like the 1250X, this does not allow for vertical movement. The Philips Norelco Electric Shaver 2100 uses a patented CloseCut Blade System which will provide an adequate shave and has the added bonus of sharpening the blades while in use. Of course, the effectiveness of this self-sharpening action is debatable since you will almost certainly be nullifying the sharpening action while clipping your beard. In this regard, you may have to let the razor run idle to actually sharpen the blade, but it is unlikely that anyone would seriously do that. The Philips Norelco Electric Shaver 2100 has an acceptable battery life for its price at 35 minutes of cordless use, however you will want to be sure to keep it plugged in and charging when not in use to maintain a full charge. The reason for this is because the 2100 takes about 8 hours to charge from a depleted battery. That means if you do not plug it in overnight, and the batter is dead, then you will be going to work with stubble. Like other rotary head electric razors, the Philips Norelco Electric Shaver 2100 is easy to clean. There is a button which releases the entire head mechanism rather than the individual heads, and you can wash it under water. However, it should be noted that the 2100 is not a wet and dry razor. You can wash it under water, but do not attempt to use the razor in the shower or with creams or gels. There are two general types of electric shaver head. The first is known as the foil. This type of razor has floating heads that glide over facial contours. This allows the razor to get into all of the nooks and crannies and awkward spots on your face. If your razor has a tendency to leave patches of hair uncut, then you likely need to use a foil head. This is most relevant for people who have sharp angular features. The second type of razor is the rotary razor. These razors also use floating heads to get into the various hollows of facial contours, but these razors are usually comprised of three or four heads with spinning cutters that are just behind a fine grid. This type of razor is often quieter and tend to be easier to clean. Some electric razors require that they be used exclusively in dry conditions to function properly or else they might short out. However, as technology and design techniques advance, more and more high-end electric razors do not require use in dry conditions. This can actually take a couple different forms. First, some razors are able to be used in wet environments like the shower. This is a benefit for those who are short on time in the early morning while getting ready for work and want to multi-task. The other form of wet razor involves razors that are able to be used in conjunction with a shaving gel. Be forewarned, if you use a shaving gel with a dry razor, you very wall may mess it up. The gel can get in the cutters or even the motor and permanently damage the razor. Many models have a reservoir that collects the hair clippings. Others simply let the clippings fall down. Hopefully, this is into a sink or a shower—depending on the razor. Regardless, all razors have some form of cleanup and few are effective enough at catching the clippings that there will not be some kind of mess at the sink to clean up afterwards. Of course, if you shave every day, you will usually not have enough clippings to worry about. For those razors that trap the clippings in a reservoir, the ease with which you can empty the reservoir can be drastic depending on the razor in question. As noted earlier, rotary razor blades are generally easier to clean up after than foil razor blades. Specifically, the heads of rotary razor blades are generally easier to remove and put back on. One of the benefits of using an electric razor is that it is gentler on those who have sensitive skin. A face with fine hair will be better suited for a different razor than one with thick hair. Likewise, if your hair is curly, then you will need a different razor than if your hair were straight. Electric razors are especially beneficial for people with curly facial hair. Folliculitis and other types of hair related dermatological conditions can be exacerbated by the use of bladed razors. Electric razors help mitigate these problems by preventing the hair from getting cut below the surface and growing into the skin tissues of the face. That is what causes razor bumps. Of course, some people have little or no issue with razor bumps and will have less to worry about. This consideration is a twofold factor. The first factor to consider is how long of a charge does the battery hold. A good electric razor will hold a charge of at least 45 minutes and up to multiple hours. Of course, rarely will you ever use an electric razor on your face continuously for that length of time, so the charge will generally last a couple weeks to a couple months. Other factors that can affect how far your battery’s charge will go is the type of hair your razor has to cut. Quite simply, thick and coarse hair requires more force to cut effectively and will ultimately drain the charge of your battery quicker. The second factor to consider is how long it takes for your battery to regain its charge. Many of the newer models can regain their charge in an hour, whereas some of the poorer charging models may take up to 12 hours to regain a full charge. This is important, because if you do not pay attention and your razor dies on you halfway through your shave before work, you may have to be late or switch to an open-bladed razor—and potentially risk the dermatological consequences. There is a general consensus that foil blades provide a closer shave than rotary blades do. Part of this has to do with the design on the foil head. The foil head generally does not pivot in multiple directions—though some of the newer models will pivot vertically as well as forward and backward, though not side-to-side. This semi-fixed position allows the hairs to more easily slide between the glide and the cutter. Moreover, the cutters can actually be closer to the skin as the glides since they generally do not move that much themselves. Rotary blades on the other hand require more passes to do the same amount of cutting. Part of this has to do with the fact that the rotary action of the razor does not as effectively guide the hairs between the grooves and the blades. This also has to do with the way your hair grows and the amount of pressure you are using: hint, the more pressure does not necessary provide a closer shave. The type of razor head you choose should depend primarily on the sensitivity of your skin. If your skin is sensitive, you definitely want to choose one of the Norelco’s depending on your budget. If your skin is not quite so sensitive, then the closeness of shave should be primary and you can go with either the Braun or the Panasonic, depending on your budget. However, if money is not a concern, then there is really no reason not to purchase one of the first two options based on whichever is better suited for your skin. The performance of the first and second pick is simply so much better than the third and budget option, that you can consider it an investment. You face is one of the first impressions you make. Make it a good one, and ensure you can do that most effectively by picking a razor that will help it make the best impression it can.